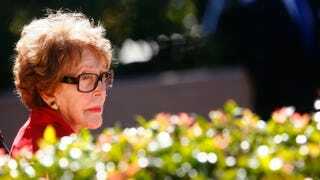 Former first lady Nancy Reagan attends a celebration held in honor of Ronald Reagan at the Ronald Reagan Presidential Library Feb. 6, 2011, in Simi Valley, Calif.
Former first lady Nancy Reagan died today in Bel-Air, Calif., according to reports. She was 94 years old. NBC News reports that the cause of death was congestive heart failure, according to her rep Joanne Drake. “Mrs. Reagan will be buried at the Ronald Reagan Presidential Library in Simi Valley, California, next to her husband, Ronald Wilson Reagan, who died on June 5, 2004,” Drake wrote in a statement. Reagan was known for her petite frame, taste for extravagant designer gowns and “Just Say No” anti-drug campaign, which has been mostly debunked by addiction professionals as deceptively simplistic, not taking into account the physiological aspects of drug addiction. Nancy Davis was an actress when she met Ronald Reagan, also an actor and president of the Screen Actors Guild. They wed in 1952 and had two children together. She and Ronald Reagan shared the White House from 1981 to 1989. The two were known to share a loving relationship in which he referred to her as “mommy” and she to him as “Ronnie.” Ronald Reagan passed away from pneumonia complicated by Alzheimer’s disease in 2004. The Reagans remain beloved conservative icons to this day. In lieu of flowers, Nancy Reagan asked that contributions be made to the Ronald Reagan Presidential Library and Foundation, Drake said.